Blythe and her best friends — Zoe the spaniel, Pepper the skunk, Sunil the mongoose, Vinnie the gecko, Russell the hedgehog, Penny the panda and Minka the monkey — are back for five more exciting escapades in the Littlest Pet Shop! Shout! Factory, in collaboration with Hasbro Studios, will release Littlest Pet Shop: Strike A Pose! on DVD June 3rd, 2014. Featuring five wild episodes, this collection features Blythe and her friends filming a TV commercial, Sunil becomes an internet phenomenon, Vinnie befriends some dancing lizards and the Pet Shop welcomes a juvenile alligator into their midst! All of these adventures and more unfold in these five wild episodes of The Littlest Pet Shop! When Blythe Baxter moved into the city with her father, she never expected to move into the apartment above the Littlest Pet Shop. But an even bigger surprise awaited her. Blythe can talk to the pets…and they can talk back! Littlest Pet Shop: Strike A Pose! delivers captivating entertainment the whole family can enjoy and contains a brand new bonus sing-along. Featuring all-new original music by Daytime Emmy® Award nominee Daniel Ingram and the vocal talent of Ashleigh Ball, Tabitha St. Germain, Nicole Oliver and Peter New, Littlest Pet Shop currently airs on The Hub TV Network in the US. I never was a fan of Littlest Pet Shop back when they first came out (back in the early 90's) because I was too old for them (I was already in my teens) but I remember my sisters liked them. 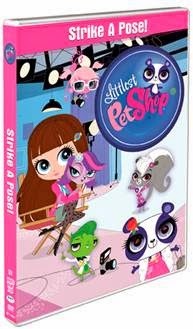 Anyway, this DVD is a fantastic Littlest Pet Shop DVD and if you have a child who is obsessed with this cartoon and the toys they will love this one because it is cute and fun and of course the sing-along is always fun.